A few months went by and they stopped calling them seizures, now they are called "Spells." A spell is a period of physical or mental disorder or distress: a dizzy spell. Ok, now the confusion is real if its a "spell," why do I pass out, unresponsive, unconscious, and wake up with no memory of what happened, why am I on the floor, why am I not where I remember being a few minutes ago, and why do I have a weak pulse and stop breathing multiple times during this time? I have questions but can't get answers. It's stressful and upsetting not knowing what is wrong and going on with your mind and body. All in all, I feel like I am not stressed enough to cause a seizure. I stress about thing I'm pretty sure everyone does, like school grades, work stress, financial stress..the norm. Dealing with medical stuff at a young age is difficult. I salute the babies dealing with the same or worse diseases, infections, cancers, etc that's younger than me because I'm strong, but they are stronger. I can't imagine their daily struggle compared to mine, they would probably switch in a heartbeat. 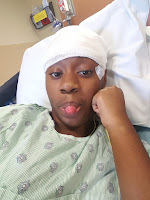 In hospital for seizure results "2016"
I been dealing with MS since 2012 from what I remember, diagnosed at 21 not the greatest birthday gift. I just want to know what's going on, why is it happening now, and how to stop it..I JUST WANT ANSWERS. If you can help me or know anyone who can send me an email!!! I have videos of these spell/seizure.